Cello and chamber music performance. Teaching cellists and mentoring advanced cellists and chamber ensembles. 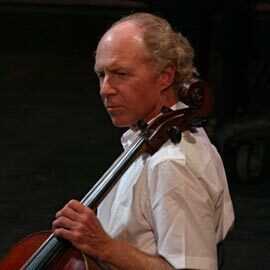 My teachers include the renowned American cellist and pedagogue George Neikrug and Scottish cellists Peggie Sampson (University of Manitoba) and Joan Dickson (Royal Scottish Academy of Music). I have played in the BBC Scottish Symphony, Toronto Symphony, Austin (Texas) Symphony, and was principal cellist of the Toronto Chamber Players and Irish Pro Musica Ensemble. As a soloist, I have performed with the National Arts Centre Orchestra, the Banff Festival Orchestra, Symphony Nova Scotia, Kitchener-Waterloo Symphony, RTE (Ireland) Symphony, and the Irish Pro Musica Ensemble. I have performed extensively as a recitalist and have recorded the complete cello works of Beethoven and the Brahms Sonatas with fortepianist Boyd McDonald. Throughout much of my career, I have worked with chamber music ensembles, including the Penderecki, Orford, Brunswick and University of Alberta String Quartets; the Galliard Ensemble; new music groups Blue Rider Ensemble, ARRAY New Music and NUMUS Ensemble. I have recorded over 30 CDs of chamber music and cello repertoire. As a conductor, I have appeared as a guest with the Symphony New Brunswick, Kitchener-Waterloo Symphony, Mississauga and Georgian Symphonies and am currently resident conductor of the NUMUS Ensemble. I have also been conductor of the New Brunswick and KW Symphony Youth Orchestras and conducted the premiere of Tim Brady’s opera, The Salome Dancer as well as the recent workshop presentation of his new opera, The Record Player. For a performer, recording is the equivalent of publishing in the academic world, and I have been fortunate to have wonderful colleagues (Blue Rider, Penderecki Quartet, Boyd McDonald) to work with on numerous projects. My current interest (passion) is recording the Bach Cello Suites. Volume I (Suites 1, 2 and 3) was released in January and Volume II is in progress. Over the past few years, I have been a jury member for the Juno Awards and the Orford String Quartet (OAC) Scholarship. Blue Rider Ensemble was awarded a major Social Sciences and Humanities Research Council grant (3 years) to research and create a chamber music/theatre work based on Mary Shelley’s novel Frankenstein called Frankenstein’s Ghosts. I have received 2 KW Arts Awards (Dennys). I have had students win recent awards such as the Michael Measures Award (Canada Council), which selects the soloist with the National Youth Orchestra of Canada. I enjoy mentoring interested students and have placed young conductors in post-graduated programs in Canada, the U.S. and Austria and cellists in programs across Canada, the U.S., France (Paris Conservatoire) and England. J.S. Bach Unaccompanied Cello Suites, Volume I (Suites 1, 2 and 3) with fortepianist Boyd McDonald. Ludwig von Beethoven Complete works for Cello and Fortepiano (ebs). Johannes Brahms Cello Sonatas and Songs for Alto and Cello (doremi). Bela Bartok Complete String Quartets (Nos. 1-4). Johannes Brahms Piano Quintet in F minor. Johannes Brahms String Quartets Nos. 1 and 2, Op. 51. Benjamin Britten String Quartet No. 3, Op. 94. Dmitri Shostakovich Piano Quintet in G minor, Op. 57. Dmitri Shostakovich String Quartet No. 3, Op. 73. Alfred Schnittke Piano Quintet (1972-76). Krzysztof Penderecki Complete String Quartets. Various composers Polish String Quartets. Arnold Schoenberg Pierrot Lunaire, Don Crockett The Cinnamon Peeler. Peter Hatch history is what it is. Laurier is an ideal environment for the study of music performance, and I feel very fortunate to be a part of the faculty here. My colleagues are highly skilled players and dedicated teachers who contribute to a creative and exciting environment where a serious student can develop into an advanced young musician with exceptional experience in his or her preferred area. The Laurier String Faculty is like a big family, and all students are mentored and encouraged according to their individual abilities and needs.